Personally, I have never been a fan of net curtains. I love to be able to look out of my window and see the trees, the sky, the birds, it gives me a sense of connection, a link to the outside world. However, depending on where you live, your window may be somewhat exposed to the eyes of passers by. Here’s something I came up with which doesn’t completely do what a net curtain will do, but nevertheless breaks up the line of vision and usually absorbs people’s attention in its own right. A decorative window curtain, or display. The great thing about this is that it’s really fun to make. You can allow your creativity full reign and add things in different colours and textures, or you can use pieces that are all the same tone with just a few accents of colour here and there. You could choose a specific theme, the obvious one at the moment being Christmas decorations, with pretty fabric hearts in vibrant reds and greens, or later in the year change to a nautical theme usings blues, pieces of string with driftwood and shells for example. You could make a statement with unusual recycled or vintage artifacts. shabby chic style, or handpaint your own glass baubles or wooden hearts. It’s also a very affordable alternative to curtains as you do not have to have to spend a lot upfront, but can add bits as you go along. If you’re a collector, like me, you’ve probably got lots of bits of ribbon and buttons tucked away somewhere. Or create a 3D scrapbook of memorabilia. What’s great is you can just remove anything you are bored with, and change with the seasons. 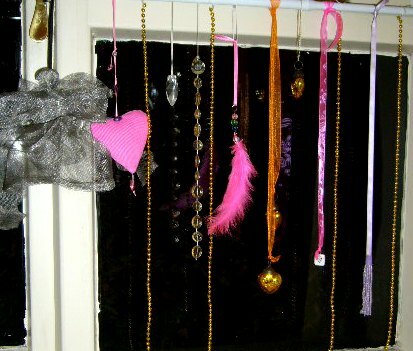 I have hung my bits and bobs over a simple curtain rod which can be bought very cheaply and has a spring mechanism which holds it in place in the window recess so no need for drills or anything high tech. Just measure your window before you buy the curtain rod to be sure you buy the correct size. Of course this is quick and easy to apply if your windows are as small as my present home. 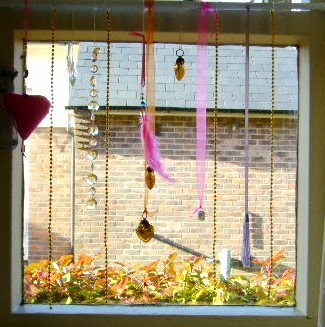 In a larger window I had in my previous house I bought a beaded door curtain and hung this from two hooks in the centre of the bay window. I cut it to the length of the window sill, but of course check that the beads are fixed individually before doing this! You can personalise as you wish, adding beads or ribbon to suit your taste and the mood of the room, or leave plain if you prefer a simple look. Post us a picture when you’re done. Have fun! !